Ruler of the system is Sun, the giver of life. Its influence is vitalizing, hot, dry and constructive. It governs the heart, vitality, blood and brain. The right eye in a male and the left eye in a female. Sun causes physical disorders and those arising from cold. Operates chiefly through the anterior pituitary gland, to affect the circulation of the blood through the heart and the arteries; the tear ducts; the spinal cord. Ruler over the natural function of the body. It is cold, moist and assimilative, and governs the breast, stomach, fluidic and lymphatic systems. Left eye in a male and right eye in a female. Moon denotes functional disorders and irregularities of the furor. The substance of the body, as distinguished from the vitality flowing through it; the alimentary canal; the child-bearing female organs and functions; the lymphs; the sympathetic nervous system; the cerebellum, the lower ganglia. Ruler over the brain and mind its nature is changeable and variable. The Nervous system, lungs, tongue, speech, hands, arms and mouth are under the influence of this. Mercury affects nervous and mental disorders. The thyroid gland; the brain and the cerebro-spinal nervous system; the sense of sight; the tongue and the organs of speech; the hands as instruments of intelligence. Warm and Moist in nature and governs the throat, chin, complexion, cheeks, Umbilicus and the internal parts of the generative organs. Venus produces complaints caused by excesses and pleasures. 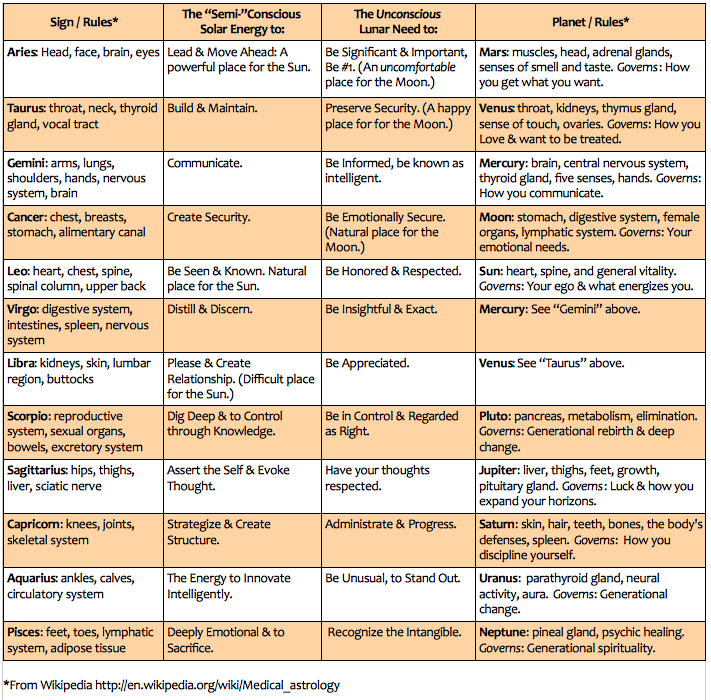 The thymus gland, the sense of touch; the throat, kidneys, and to some extent the generative system. 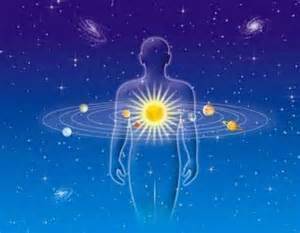 Its influence has been said to operate through the solar plexus, upon the functions of digestion and nutrition. It has an indirect influence upon features, complexion, hair – in so far as those express beauty. Is hot, dry and inflammatory. It governs the forehead, bile, nose, gall and muscular system. 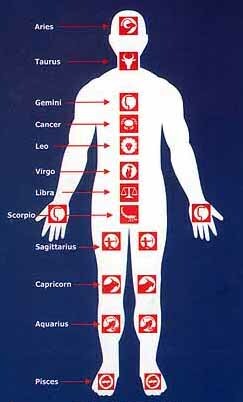 Mars causes inflammatory disorders and accidents. The cortex, or cortical portion of the adrenal gland; the head, externally; the sense of taste; the breasts and the maternal functions, and in part the generative organs; the motor nerves; the excretory organs; the red corpuscles of the blood. Warm and Moist in nature but mild. Governs the blood, seed, liver, arterial system, pleura, right ear and the absorptive system. Jupiter disposes to blood disorders and diseases due to excesses. The posterior pituitary gland; feet, thighs, liver, intestines, blood plasma, muscles, growth; also control of shoulders and arms, in motions that for effectiveness depend upon good timing. Cold, dry, contracting and obstructive. Rules over the joints, bones, spleen, teeth, knees. 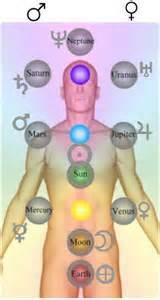 Saturn denotes chronic complaints through cough, cold and nerve weakness. The medullary portion of the adrenal gland; the skin and the secretive system; teeth; bones, joints and tendons-particularly the knee and the calf of the leg; the spleen; the organs and sense of hearing. Ailments: anything to do with the head. Headache, migraine, sinus problems, head colds, nosebleeds, fever, inflammation, hemorrhage, high blood pressure, eruptions, burns, scalds, insect bites and stings. Ailments: associated with the kidneys and any problems that arise with them, those conditions brought about by excess and over-indulgence, obesity. It is associated with venereal diseases. 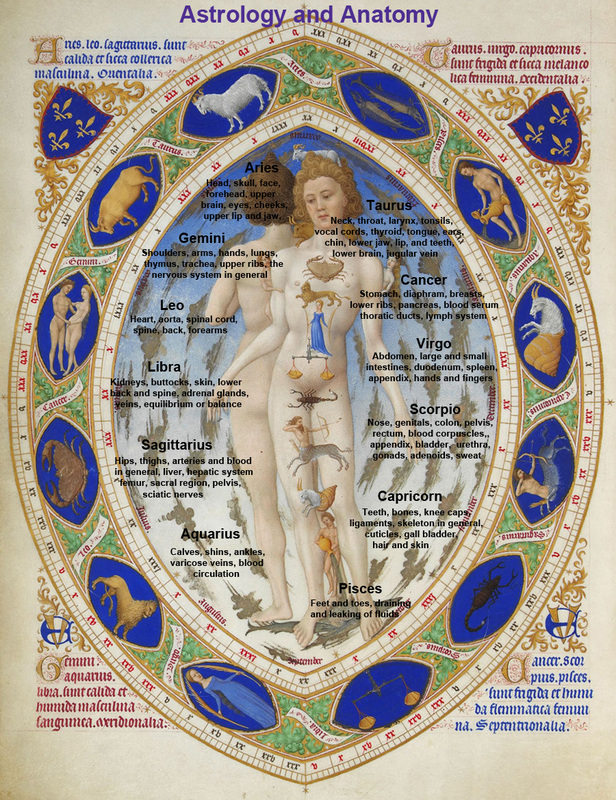 Ailments: Pluto rules Scorpio so it is associated with ailments of the reproductive and excretory systems. It occasions deep changes within whatever condition arises. Can be likened to a volcano bubbling beneath the surface. Ailments: anything hidden or deep. Ailments: Jupiter rules the liver and any complaints of it. As Jupiter’s main keyword is that of expansion, it governs swellings and things that grow such as tumours and other growths, either malignant or benign. It is also associated with being overweight and over-indulgence in food, alcohol and drugs. For example, if your Sun is in Aries, you’ll read “Solar Energy” and if your Moon is in Aries you’ll read “Lunar Needs”. We tend to be more conscious of our Solar Energy than we are of our Lunar Needs.